The Summer Reading Challenge takes place every year as children break up from school for the summer holidays, and it’s a great way to get children reading a variety of different books throughout the long break. Every year there’s a different theme. 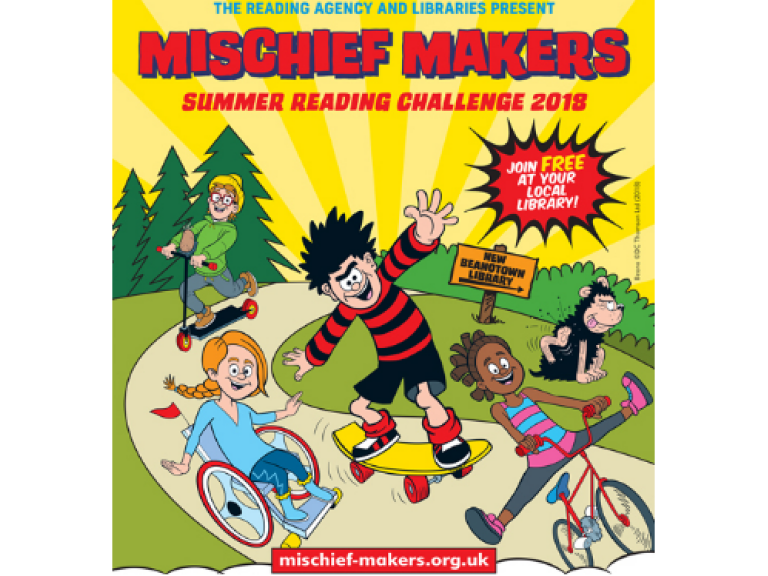 The Summer Reading Challenge 2018 is called Mischief Makers, inspired by the much-loved iconic children’s title Beano, which celebrates its 80th anniversary. Children will have the chance to not only broaden their reading horizons, but to take part in fun quizzes and competitions too. Your child can register at your local library. There are exclusive rewards to collect along the way, and it’s FREE to take part! Taking part is simple – when the summer holidays start, your child can sign up at your local library. The sooner you go the longer your child will have to read six books. Staff will register your child for the Challenge and give them some fun materials to get them started. Most libraries start the Challenge on Saturday 14 July 2018. There is not an official end date for the Challenge. Each library will set their finish date. So it’s best to check with your local library to find out when the Challenge will finish in your area. Each time your child reads a book, they can add it to their online profile, give it a rating out of 5 and they’ll also have the chance to write a review about it for others to read and see if they fancy reading that particular book too. There are plenty of books to choose from at the library, if your child is unsure about which books to read, then once they’ve signed up for the challenge and also registered online, they can make full use of the ‘book sorter’. This recommends books that have been read by other children, based on the type of books your child loves to read. The website is also full of great quizzes and competitions. These not only provide the perfect chance to improve or brush up on reading and writing skills, they also allow children to get creative and maybe even win prizes from their favourite authors – how fantastic is that? For more details about the Summer Reading Challenge, and how to get involved – head to https://summerreadingchallenge.org.uk or better still pop over to your local library and ask to sign up.